Why has the Labour Party listened so late and so half-heartedly to the majority of its members who support the call for a People’s Vote? Prime Minister Theresa May’s Brexit deal has been defeated in Parliament by a devastating majority of 230; Labour’s vote of no confidence in the government has predictably failed; and the Brexit project has run aground on its own contradictions, leaving the country hurtling without a plan toward March 29—at which point, deal or no deal, Britain will leave the European Union unless an extension is requested and granted. May’s Plan B merely offers tweaks to appease the right wing of her own party, as well as vague promises regarding workers’ rights and the environment to entice Labour. For its part, the Labour Party has proposed an amendment that would give Parliament a vote on whether to negotiate a much softer Brexit with a permanent customs union, as well as a vote on whether to hold a second referendum “on a deal or a proposition that has commanded the support” of the House of Commons. Neither May’s nor Labour’s plan is likely to be passed. Nobody has the faintest idea what happens next, and nobody has come up with a convincing narrative that might start to heal the rifts. A recent poll showed more than 25 percent of men (but only 16 percent of women) in favor of a no-deal Brexit, despite countless warnings from trade unions, businesses, farmers, universities, the Bank of England, and the National Health Service that it would be catastrophic. 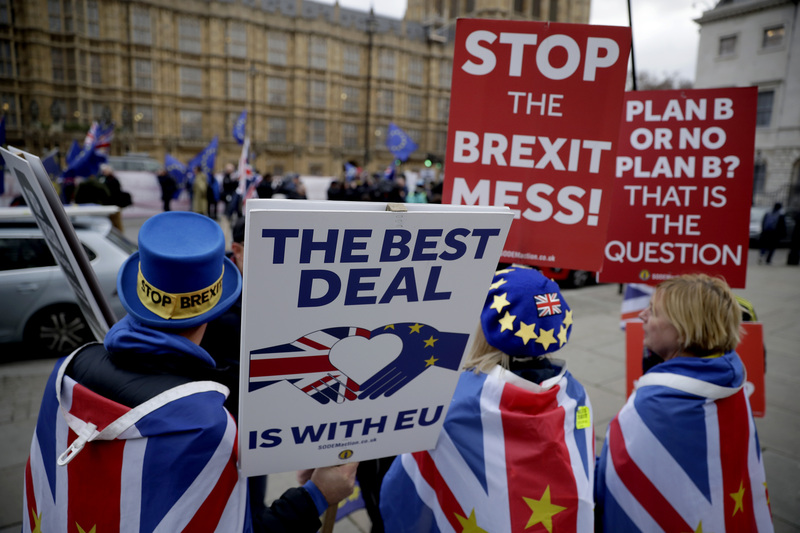 No deal is the political equivalent of the yellow vests now spreading from the streets of France to London and Berlin: an empty signifier of anger and discontent worn by the populist right, but also by some ideologically purist sections of the left. The referendum on Brexit was called by then–Prime Minister David Cameron to scotch right-wing Tory rebels, but the EU project divides both of Britain’s main parties. From the start, Labour radicals saw it as a rich man’s club enforcing free-market capitalism; Labour reformers welcomed, among other things, the rights that the EU enshrined and the checks it imposed on Britain’s recalcitrant bosses (though the Working Time Directive, which caps the length of the working week and mandates paid vacations, was challenged by Tony Blair’s government in the European Court of Justice in 1998). It was Labour Prime Minister Harold Wilson who held the first stay-or-go referendum, in 1975, to keep his split party together; unlike David Cameron, he read the runes right and won. Forty years later, the European Union is more powerful and pervasive, but not more democratic. Its destruction of countless lives in Greece, Italy, Spain, and Portugal in the name of fiscal discipline is unforgivable. It has fostered rather than contained the rise of the far right, while failing to meet even its legal obligations to the refugees at its gates. Authority trumps cooperation and solidarity. But the debate (such as it was) before the Brexit referendum was not about those things. It was mostly about the principle enshrined in the single market: that if capital can move freely, labor must have the same right. The Leave campaign—a torrent of lies and online propaganda funded by friends of Trump, twice ruled in breach of campaign-spending laws—weaponized England’s xenophobic, postimperial malaise in order to blame “free movement” for all the ills that globalization, deregulation, austerity, and regional neglect have visited on the country’s citizens: hollowed-out towns with boarded-up shops and homeless people in the doorways; failing schools and hospitals; no work and nothing to do. The story will be familiar to Americans. For the hard-right Brexiteers of the secretive European Research Group (and those hoping to ride their coattails to the heart of power), Brexit is the wedge that will open the door to unfettered privatization, the weakening of government, and the final destruction of the postwar welfare state. Along with Northern Ireland’s Democratic Unionists, who prop up May’s minority government, these are the people dictating her “red lines,” blocking the chance of a deal to which Parliament might agree, and holding the country hostage. Barring a general election—off the table for now—and a Labour victory, any Brexit we get will lead us right, not left: Welcome to tax-haven Britain. Why, then, has the Labour Party, with its vaunted commitment to democracy, listened so late and so half-heartedly to the majority of its members who support the call for a People’s Vote, along with the Liberal Democrats and the Scottish Nationalists? While most Labour members voted Remain—especially the young, who joined in droves to support Jeremy Corbyn—the party’s northern heartlands leaned Leave. In the end, it’s the voters, not the members, who pay the piper and call the tune. Just like May’s Plan B, Corbyn’s amendment is carefully framed to hold his own party together. While some Labour MPs are passionately for a second referendum, many are just as passionately against it; some front-benchers have threatened to quit if the party backs such a thing. Corbyn himself has been an ardent, if now closeted, left Brexiteer, arguing that the EU would block state aid to industry and a socialist economic recovery. Experts on EU law have argued that only two of the 26 economic proposals in Labour’s last manifesto could fall afoul of EU regulations; besides, no Labour Remainer wants to keep the European Union unchanged. Meanwhile, the potential for harm from Brexit—to jobs, wages, rights, the environment, food supplies, health care, you name it—is immeasurable. Without that gravitational relationship to Europe, Britain becomes a tiny, distant moon of Trump’s America or Xi’s China. For all its flaws, the EU’s capitalist club is our only available forum for addressing the intractable issues facing us: climate catastrophe, right-wing populism, disenfranchisement, displacement. To ditch it rather than reform it is to buy into a right- or left-wing isolationist fantasy. And yet, deal or no deal, that’s almost certainly what Britain is about to do—not because Brexit will reduce the suffering that led Labour supporters to vote for it, but because of a gamble by a weak Tory prime minister to hold his party together. The tragedy is that Labour, equally divided, failed to point out his sleight of hand, or to put forward the argument that the EU has little to do with the real issues facing the country, or to make an impassioned case for staying in and working with Europe’s socialist parties to change the status quo. Clarification: We have amended the wording to make clear that Theresa May’s government is propped up by Northern Ireland’s Democratic Unionist Party, not the Ulster Unionist Party.